Chinese human rights lawyers take a huge personal risk in defending practitioners of Falun Gong, a traditional Chinese spiritual practice that continues to be the subject of a brutal persecution by the communist regime. Gao Zhisheng, once a leading attorney in China, was jailed for nearly a decade and badly tortured on a number of occasions because he provided legal aid to practitioners. Undeterred, other lawyers continue to plead not guilty for Falun Gong cases, which are some of the most sensitive in China. On Sept. 13, a team of four rights lawyers took the argument one step further in Dongli People’s Court in the eastern Chinese port city of Tianjin. In defending Zhou Xiangyang and Li Shanshan, a husband and wife whose faith in Falun Gong marked them for constant persecution, the lawyers contended that the suppression of those who adhere to the universal values of truthfulness, compassion, and tolerance—Falun Gong’s core tenets—constitutes a crime against humanity. Speaking to New Tang Dynasty Television (NTD), Yu Wensheng and Zhang Zanning, two lawyers from the legal team representing Zhou and Li, talk about events in court, as well as their decision to defend Falun Gong practitioners. NTD is an independent Chinese-language broadcaster and sister media outlet of this newspaper. On July 20, 1999, then Chinese leader Jiang Zemin ordered Falun Gong suppressed. A state survey had reported 70 million Chinese citizens from all walks of life were practicing the spiritual discipline, although Falun Gong sources peg that number at over 100 million. Millions of non practitioners were also made to participate in mandatory hate sessions, and could lose their jobs if they protected practitioners. Over 4,000 practitioners have been killed by torture and abuse, according to incomplete figures from Minghui.org, a clearinghouse for information about the persecution. The U.S. Department of State has cited reports that half of all those held in China’s labor camps were Falun Gong practitioners, a number in the hundreds of thousands. Researchers say that the regime harvests organs from still-living practitioners, killing them in the process. Investigative journalist and researcher Ethan Gutmann has likened organ harvesting to “slow motion genocide,” and a recent report that he co-authored estimates that prisoners of conscience were the source for the organs for 60,000-100,000 transplantations each year during the period 2000-2015, with Falun Gong practitioners the predominant source. The United States House of Representatives and the European Parliament have recently issued resolutions condemning the practice. The case of Zhou Xiangyang and Li Shanshan, which has been documented by Amnesty International and other human rights organizations, is one of the more well-known instances of persecution. Zhou, formerly a railroad engineer, was arrested in 2003 for practicing Falun Gong, and sentenced to nine years in jail. Inside Tianjin’s Gangbei Prison, Zhou was subjected to brutal beatings, shocks with electric batons, and other painful forms of torture. Touched by the sufferings Zhou endured for keeping his faith, Li told prison guards to marry them in 2004 after the guards refused to let her see Zhou because they weren’t related. The guards eventually allowed Li to visit Zhou as his fiancé, and they were formally married after Zhou was released in 2009. The Chinese authorities weren’t done with the couple, however, and continued to harass and detain them on multiple occasions in the coming years. Their most recent arrest took place on March 2, 2015. Li Shanshan was suddenly arrested at work, and Zhou Xiangyang was also taken away later that day, according to Minghui.org. Police raided their home, confiscated their personal belongings, and removed a tracking device they placed under Zhou’s car. Zhou carried out a hunger strike to protest his detention, but the guards at Tianjin’s Dongli Detention Center rammed a tube down his nostril into his stomach to force feed him, Minghui reports. During this ordeal, the guards kept Zhou’s hands handcuffed behind his back. On Nov. 30, 2015, Zhou Xiangyang and Li Shanshan were hauled into Dongli People’s Court in Tianjin for a public hearing. There was a heavy police presence outside the court building, and officers frequently stopped passers-by to check their identification. Minghui reports that the police arrested some of the court attendees. The couple were charged with violating Article 300 of the Chinese criminal law, a vaguely worded charge—”using a heretical religion to undermine the implementation of the law”—that the regime rolls out to prosecute practitioners. In the case of Zhou and Li, they were found guilty of possessing DVDs and cellphones containing Falun Gong information. Judge Zhang Yaling gave spurious reasons to deny the lawyers hired to defend Zhou and Li from representing them. Refusing to allow the couple to properly defend themselves, he concluded the hearing in 30 minutes. When the Falun Gong practitioner husband and wife were next brought before the Tianjin court on Sept. 13 this year, they took part in a highly unusual event. However, Judge Zhang stopped interrupting the lawyers after Wang Shaoping, Zhang’s elderly mother, chastised him for not presiding over a fair trial. Over the course of an hour, Yu Wensheng read in full a statement in which he pleaded that Zhou Xiangyang and Li Shanshan were not guilty for practicing Falun Gong because the Chinese constitution granted freedom of belief. He then argued that Falun Gong’s teachings of truthfulness, compassion, and tolerance are universal values, and the suppression of those who follow these values is a crime against humanity. This is the first time a defense of the practice’s core tenets has been made in a Chinese court. The court session ended up lasting for about seven hours, a stark contrast to the half-an-hour trial last November. The police didn’t make any arrests among those present even though a defense that directly challenged the basis of the persecution was made. 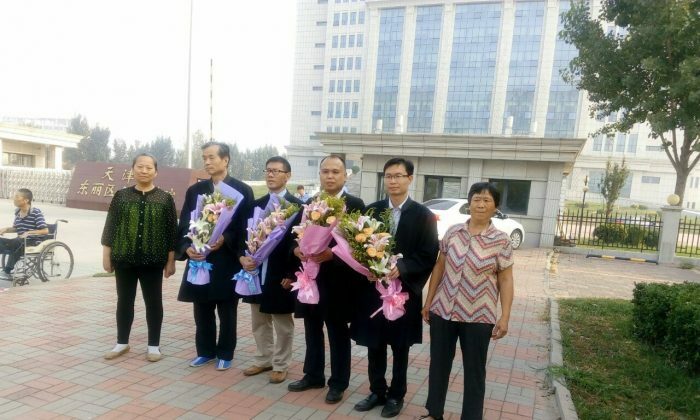 After the trial, the mothers of Zhou Xiangyang and Li Shanshan presented flowers to the four lawyers, and posed for a picture with them outside the courtroom. They weren’t harassed by the thicket of police nearby that appeared to have been mobilized specifically for this trial. Zhang Zanning, a lawyer and lecturer in the law faculty of Southeast University in Nanjing, offered a more technical explanation of his defending Falun Gong practitioners Zhou Xiangyang and Li Shanshan. As for Article 300, Zhang says that it is the onus of the prosecutors to single out specific items of the law that practitioners had supposedly sought to “undermine.” He then gave the analogy of public prosecutors charging someone for murder without stating the murdered person’s name, manner of death, or even producing a body as evidence. “Isn’t such an accusation of criminality absurd,” Zhang Zanning said. Zhang said he had been asked many times why he chose to defend Falun Gong cases, which are deemed too sensitive in China. Prominent Chinese human rights lawyers like Gao Zhisheng, Tang Jitian, and Teng Biao have all defended practitioners, and were subsequently arrested and abused. But ultimately, it’s the desire to uphold legal integrity that drives Zhang. “I know there are risks, but it’s precisely for my personal safety and political safety that I plead not guilty on behalf of Falun Gong,” he said.